Today we are going to discuss about an important aspect of saree that is going to make world of difference to your overall style. It’s the saree blouse sleeve design. Unfortunately, many take it for granted and often would stick to boring styles. 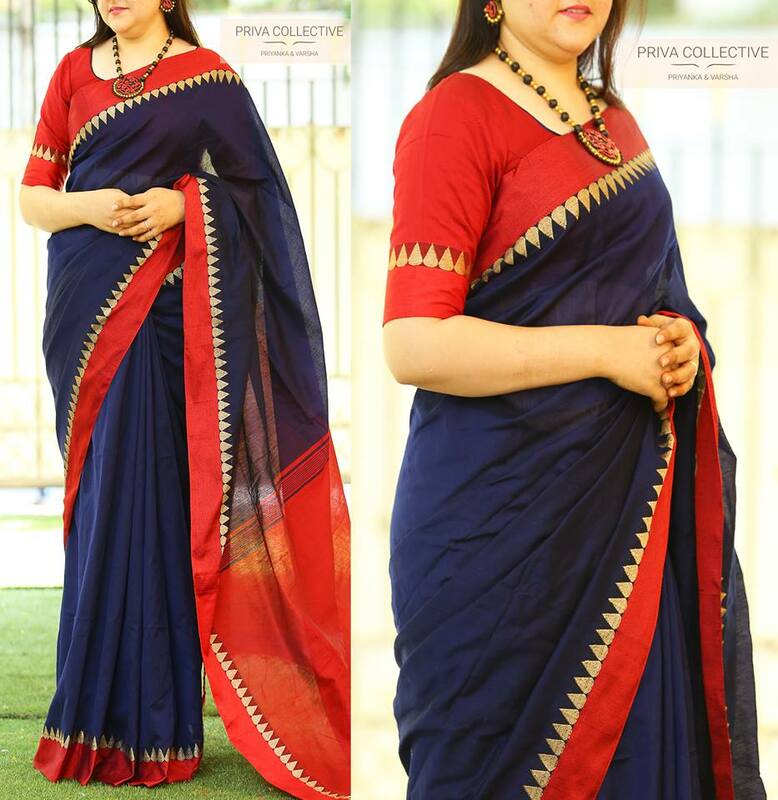 If you care to see this as a wonderful aspect to improve your saree look, you will get lots of compliments for it. 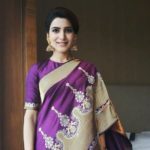 Suppose say, you always stick to the standard half sleeve blouses, next time try a elbow sleeve blouse instead, and wear the same saree, then you will notice how a sleeve style can alter your look. Similarly, if you have been trying boring plain sleeves, next time wear with slight adornments like a thread work or mirror work. 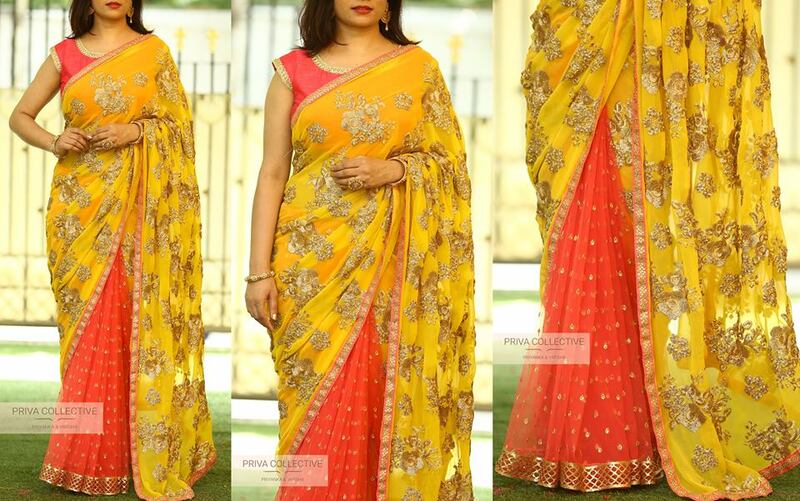 You will notice that your saree in instantly boosted with festive look. 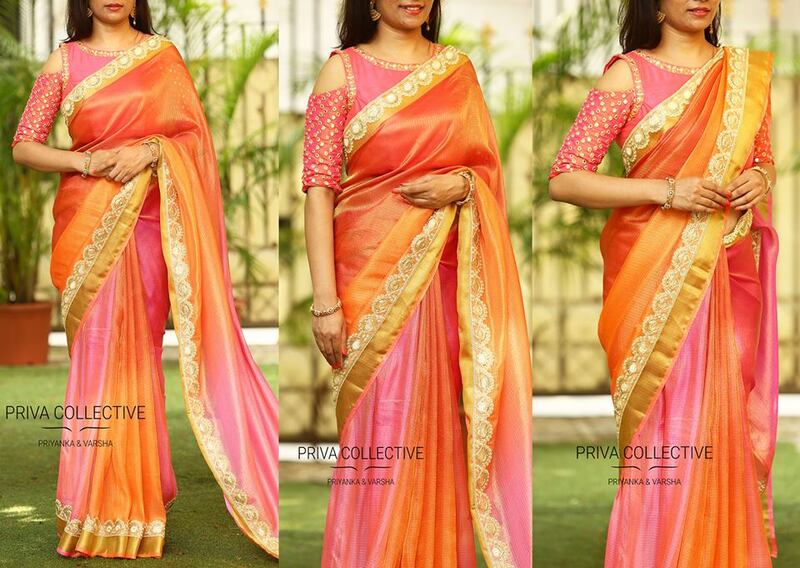 A blouse sleeve, by all means, plays a very crucial role in defining your saree style. So you need to invest your time to find out how to make this work in favor of you. We hear your question, what kind of sleeve should I opt? To begin with, there are two things you need to consider in blouse sleeve. One is the length of sleeve. And the next is the type of embellishments you can experiment on your sleeves. By playing with the above two factors, every time you can surprise others with an innovative style that compliments your beauty. To seek inspirations, we pulled out few bewitching blouse styles from the lable ‘Priva Collective’. 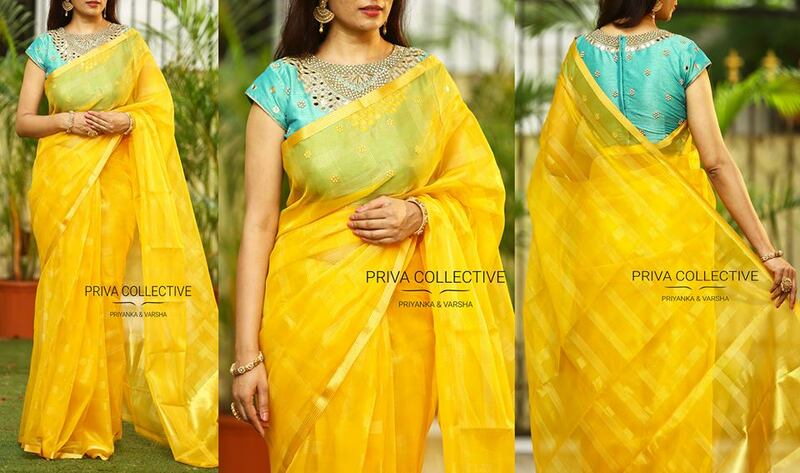 We are an ardent fan of their saree and blouse collections. So when we researched for blouse sleeves, we know in a second, whose door we should knock. If you like to shop the saree and blouse featured on this post, contact details are given on the end of this post. First, let’s see all the latest sleeve styles of this season. So you can figure out which one you should select for your next saree blouse. 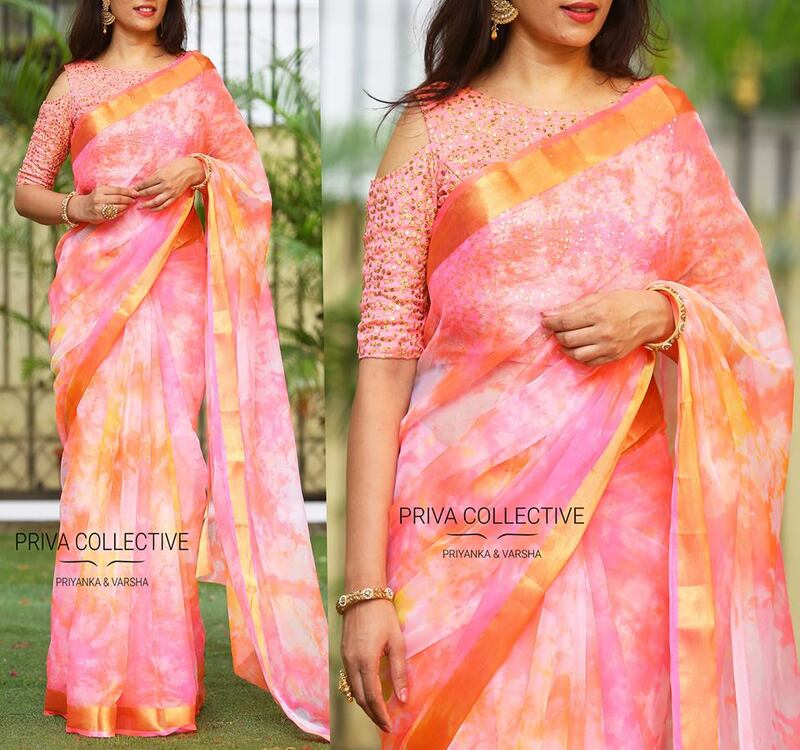 If you don’t mind being fashion forward on your sarees, then take a break from the boring sleeve patterns and opt for this sophisticated style. This is the classic half sleeve pattern that has been staying close to us for ages. And it still tends to rock with our sarees. Those who are conscious of fat arms should stick to this one, but you can compensate with eye-catching embellishment over the sleeve. This sleeve style can instantly add a fashionable touch to your sarees. Though it can be worn with any saree, we highly recommend you to try this with party wear drapes. When you wear this style, see to that the sleeve stands out by opting for attractive embroidery or stone work here. Those who have fine toned hands should flaunt this without a doubt. Wear this with light weight body hugging saree to show off your well toned body. Sometimes even eliminating the sleeves altogether would also look totally cool. Sleeveless blouse are not new to us. However, to give a stylish spin to this style, try a pearl or bead embellishment on the shoulder strap. A bell sleeve with boat neck is such a regal combination to wear with sarees. It will give a fresh appeal to your look. This is another interesting style for those who like to hide their flabby arms. Showing off your fine hands underneath a layer of net will add a dose of glamour to your look. The long 3/4th sleeves are making a comeback this season with more fervor. 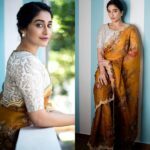 We already see celebrities and style icons embracing it in all their saree style. You should as well try this. Cold shoulders are another hot style of this year. Go trendy with your sarees by letting a glimpse of your bare shoulder do the magic to your look. The fact that this blouse sleeve remains the first choice for all brides-to-be shows how special is this sleeve style to young women. Okay, we went through various sleeve lengths, that can bring the real charm of your saree blouse. Now time to check out the inspirations you need to get the right embellishment done on these sleeves. A glittery embellishment around your elbow is must-try out design for all your party wear blouses. Do you like zari borders? Then to make the blouse even more festive, try bold zari border with zardosi work. While flawless cuts outs at the back neck is the usual way of getting your blouse done, this time, give a break, and try cuts outs on shoulders and sleeves for a change. To make the transparent sleeves shine thorugh your designer saree, opt for glittery sequin work. Alternative to sequin work, you can even try zari thread work for an attractive blouse style. No one can forget the beauty of bold embroidery. While full embroidered blouse is the standard model, you can even try different by opting the thread work only on the sleeves. If your blouse is so plain and blunt, opt for contrasting sleeves that stands out from the saree and bodice. Give a life to your plain sarees by adding catchy mirror work. Another way to get your sleeves notice by others is to opt for customized patterns like below. You can opt for animal, vehicle, instrument, face of a person, and other notable prints on your sleeve. Nothing can keep your blouse sleeve fresh than an artistic floral work. Innovative prints can take your blouse for a chic look. If the blouse is plain, you can add a temple border to it. 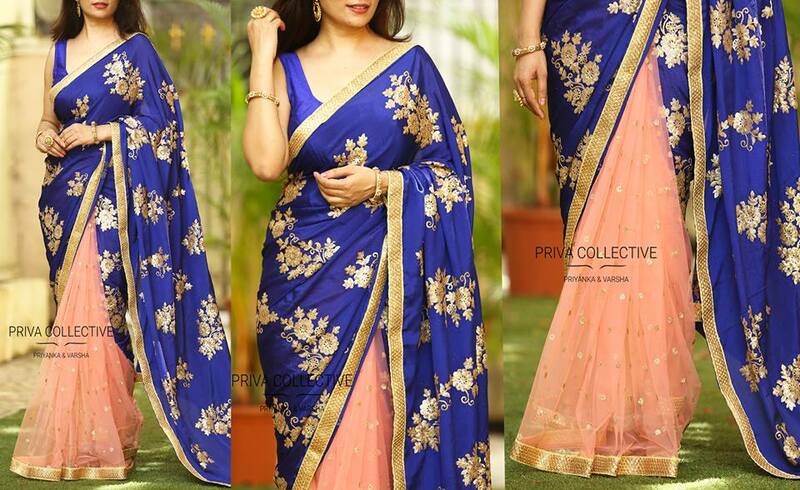 It will give a traditional look to all your plain sarees. There are plenty of other borders available on the market; if you like you can experiment others too. 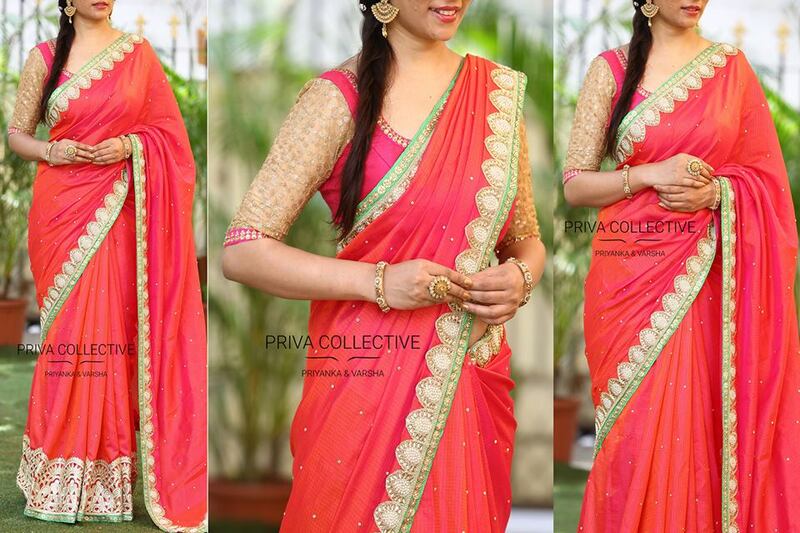 Having bold check boxes in contrasting shade is going to get you noticed for your saree and blouse choice. Bored of net sleeves, try lace one. They too add a subtle designer touch to your sarees. Nothing can beat the fancy look of full blown stone work on your sleeves. Want to try something simple and be effortless on your look? Try a simple zari border around your sleeves. If you are bride-to-be, then this is the must-try for you. Get a scattered bead work on your blouse sleeve and see how it amplifies your saree look. These are various sleeve adornments that can make your blouse stand out from the rest. Do give these blouse sleeve designs a try and let us know how it turned out. In case, if you like to shop the sarees and blouses featured on this post, do check the label below for inquiries. What is your preferred sleeve style? Do you have any other creative design on mind? Drop your comments and let us know. 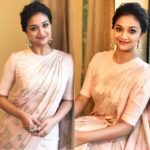 11 Normal Blouse Neck Designs For Simple Saree Style! How could they forget puff sleeves? Yes, puff sleeve is one to try with traditional sarees.